In the spirit of over-analyzing preseason performances, here are three takeaways from “Team White’s” 3-1 win over Team Burgundy during the Colorado Avalanche’s intra-squad scrimmage on Sunday at Magness Arena. No. 3 — Possible forward combos revealed? 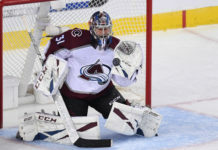 The combination of Mikhail Grigorenko, Nathan MacKinnon and Alex Tanguay produced the White Team’s first goal of the evening when Tanguay cashed in a nice pass from MacKinnon. 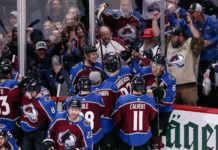 Tanguay was content but said the group “could’ve easily had two or three more goals.” The line has played together every day of training camp. There’s a little less evidence to suggest that the line of Carl Soderberg, Landeskog and 18-year-old Mikko Rantanen is here to stay. The three practiced together as a line for the first time on Friday. 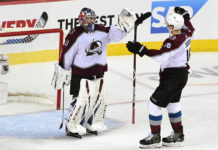 But the chemistry was evident early on, and the team’s first round pick in Rantanen scored the White Team’s second goal of the game.